Report Blames Beslan Terrorist Attack on... Local Police? Report Blames Beslan Terrorist Attack on… Local Police? Russia published initial reports today blaming local police and officials for the most horrific terrorist attack in Russian history. Five officers are being charged for negligence. …where the terrorist in the background has his foot on a switch that is wired to grenades throughout the gymnasium. It was here where the children were forced to sit for three days and drink their own urine to survive. In the month leading up to the Beslan school siege that began Sept. 1, 2004, Russian security services received intelligence about an impending major terrorist attack in the North Caucasus, warnings that quickly zeroed in on the possibility of an assault on a school on the first day of the new academic year, according to a preliminary report by a parliamentary commission investigating the blood bath. But a telegram to authorities in the region from the Russian Interior Ministry asking them to tighten security at schools was ignored in what the chairman of the committee said was a display of “negligence and carelessness in facing a real terrorist threat.” Only a single unarmed policewoman was stationed outside Beslan’s School No. 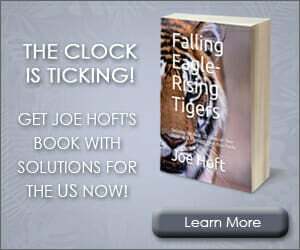 1 when at least 32 terrorists stormed the school, and she was taken hostage. The three-day siege ended in a storm of fire and bullets and left 331 people dead, a majority of them (186) children. Although, Russian officials considered that there may be an attack, they did not know exactly where the attack would happen. Now police are somehow blamed for one of the most heinous acts of terrorism that the world had seen live on Russian Satellite TV… There is definitely a problem in Russia when the headlines are blaming the police and not the terrorists who slaughtered the innocent children. It wasn’t the police who shot a hostage the first day in front of the children to show their ruthlessness. 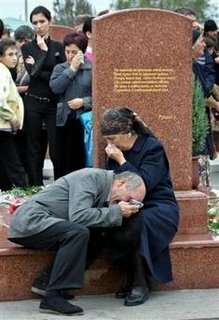 Grandparents of Boris Dzhibilov, 9, who was killed in the school hostage taking, cry at their grandson’s gravestone at the cemetery in Beslan, Saturday, Sept. 3, 2005. Beslan was certainly not the first time Russian officials were faced with a terrorist-hostage situation and it wasn’t the last. 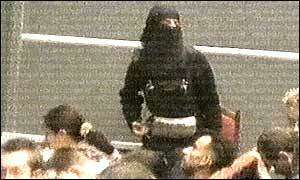 On Wednesday October 23, 2002 Chechen hostages stormed a Moscow theatre during a performance and took the entire audience hostage. It wasn’t Russian special forces who strapped bombs on their wastes. Yet, when the theatre was gassed to put the “black widow” bomb-packing female terrorists to sleep, there were hostages who died from the gas as well. 41 terrorists were killed when special forces stormed in. Of the 800 theatre-goers held hostage, 129 died. Russian officials were blamed for the deaths of the hostages who had died. They were slow to release information on the gas used and it is unclear (to me) if that would have saved those at the theatre. 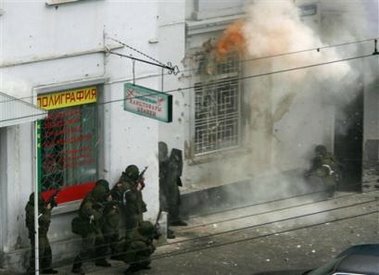 On Thursday, October 13, 2005, Chechen terrorists attack the Russian city of Nalchik in the most extensive terrorist assault ever carried out on a whole city. Simultaneous raids took place at 3 police headquarters, federal military bases, a gun store and the regional airport. Twelve civilians and 24 members of the security forces died in violence. 91 terrorist attackers were killed and at least 36 captured. In the final phase, authorities rescued 7 hostages and killed the remaining terrorists. Russia has a record of eliminating terrorists in hostage situations. Russia also has a mixed record on rescuing “all” of the hostages. 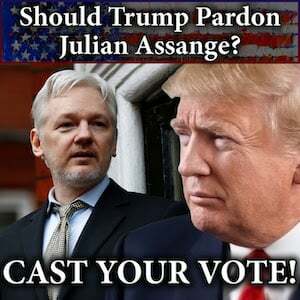 Certainly, there are improvements that need to be made. But, to blame Russian officials, police, special forces and not the terrorists for the death and destruction is insanity.